First, as far as hair length goes, right now I have hair that is about half-way down my back. The reason I have long hair is simply because I like it. =) Until I was 12, my hair was usually chin- to shoulder-length, because my mom didn't want to have to deal with tangles or long hair. When I was 12, she gave me permission to grow it out, since I would be the one caring for it. Since then I have kept it long because I enjoy how it looks, it feels feminine, and my dad likes it long as well! Hair needs taking care of in order to look pretty and healthy. I've found that a shower every-other day is what I need to keep it nice and manageable. Any longer between showers, and it gets greasy; any more, and I don't like dealing with wet hair every day! To wash it I use dandruff shampoo, and whatever shampoo and conditioner (though a small amount of this) that I happen to have. Right now it's one a friend sent me for frizzy hair, which is working nicely! Usually, though it's just whatever is cheap. :-) I don't like blow-drying my hair, as it tends to leave it very poofy and frizzy, so I let it air dry after I take a shower, which is usually almost first thing in the morning. If I go somewhere before it dries, I may use a hair dryer to quickly finish it off, but usually I just braid it and go on my way. My favorite hair style is to leave my hair down and pull the front part back with a simple hair clip. Sometimes I'll pull it back with a bow or ribbons to make it special. A simple braid is nice to get it out of my way, and I'll French braid it sometimes as well, which keeps it nicely managed. I don't usually do two braids, unless I want to look really young. =) I often put it up in a regular pony tail as well, though after a while my long hair gets heavy, and weighs down on my head, so I don't usually leave it in too long. For dance classes, I quickly wind my hair into a bun. 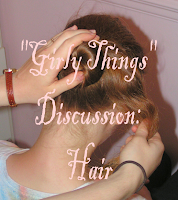 To add a special girly touch, I often use ribbons around my pony tails or buns, or on the end of my braid, or use a pretty scrunchie out of my abundant supply. There's also different pretty clips that I use occasionally. To really get fancy, I might curl my hair, though it doesn't always stay in that well. Sometimes I'll have fun playing with my hair and coming up with new styles, but the simple ones usually work best. I try not to spend too much time on my hair. I'll brush it first thing in the morning and last thing at night, and whenever it needs it during the day. I'll usually fix it in the morning, and re-fix it as needed or if I have to go somewhere, etc. Hair can be fun and a great way to show your femininity! However, as with everything, moderation is key. You don't want to spend all day in front of the mirror. ;-) Take care of your hair and keep it nice and well groomed. Your hair style doesn't need to be the latest - find one or a few that work for you, and have fun fixing it that way. Do what works for you! The last time I had my hair cut was over 5 years ago and it was right below my ears. After that, I decided I wanted to see how long I could grow my hair and so far, it's right below my waist. Though I occasionally threaten to cut it off, I don't think I can because it's so much a part of who I am now. I wash my hair every other day because, like Anna, it's terribly nasty if I wait longer and will be too dry if I wash it every day. My hair tends to be very oily anyway, so I try to find a shampoo that works for me and stay with it. I've found when I change shampoos, my hair has to adjust to it and that is interesting, believe me. I also use conditioner on my ends. Since it is so long, I put it on about the bottom third of my hair. I don't rinse out all the conditioner so that my ends won't dry out and split too much. I normally let it air-dry, but if I'm in a hurry, then I'll blow-dry the underside of my hair. But I try not to since it tends to make my hair frizz. I rarely brush my hair, instead I use a big-tooth comb. A brush tends to yank at my hair more, whereas a comb goes through easier and get tangles out better. If I want to make my hair poofy though, then I'll use a brush. With long hair, there is only so much you can do to it in a hurry. Though I would love to have it fixed nicely every time I go somewhere, I just do what I can. Normally, I grab a hairband and braid my hair quickly, which always looks fine, or I will get a hair clip and wind my hair up in a bun and clip it. I've tried hairpins and all that, but I always get headaches with my hair so tight and pins poking me in the head. In the cooler weather, I like combing my hair back and putting and clipping a little bit of it, letting the rest hang down. That is probably my favorite way to wear my hair. Now we'd like to hear from you! How long is your hair and why? What do you do to care for your hair? And any other thoughts you may have on hair! Hi! This was an interesting post! You both have very L-O-N-G and pretty hair! Mine is a couple inches below my shoulders,and it also has layers in it. I'm in the process of growing it out, but we'll see. :0) I like to use different shampoos, but I normally just stick to Herbal Essence. I have found that that brand works great in my hair! Sometimes I straighten it then curl the ends (with a curling iron) Because curling it takes away the blunt ends that the flat-iron gives. Sometime I just curl my hair, with hot rollers or a curling iron. And if I know I'm not going to be going anywhere, I'll just let it air-dry and pull it back in a pony-tail. Wow, y'all have really long hair! Mine is at about the middle of my back when it's dry. I'm trying to see how long it will grow out, and Daddy likes it long. Several years ago Mama cut my hair really short, right at my jaw bone I think. I loved that cut! It was layered and made my hair look thick. The best thing about that cut though was how easy it was to care for! All I had to do was run a brush or a comb/pick through it and shake it into place in the mornings (I washed it at night back then). I used to fuss and complain about my hair (I wanted hair like my sister' - very straight and almost never tangled.). A few months ago though, I started on the Curly Girl method, and my hair has responded REALLY well! I haven't brushed my hair in months, but you can't tell (usually). MIRIAM: That's so funny! I was also very much of a tomboy at 8 years old (six brothers and no sisters can do that to you), and though my parents (especially my dad) tried to talk me out of it, they eventually let me get my hair cut somewhere between a pixie and a bob. It looked really cute on a scrawny little girl, but that was a one-time event. Right after that I grew it out again. LENGTH - Up until two years ago I had waist-length hair (starting from the time I grew it out after the dramatic cut I mentioned above). At that point, since I was really into vintage fashion, I cut it to about shoulder-length and tried various 40's styles. I grew it out to about mid-back, and early this year cut it once again, this time to between chin and shoulder-length for 50's styles. I'm still very much into vintage fashion, and I love the short curly 50's cuts, but I'm going to go back to long hair. Short hair requires too much styling, while with long hair I can just let it down its natural waves if I'm so inclined. Short hair is hard to do in a pretty up-do... and I just have more fun with my long hair in general! I'll probably only grow it out to just above waist this time, though. Alas, my hair is on the thinner side and begins to get a bit see-through if it gets too long. I don't use any heat appliances on my hair. No curlers, no hair dryers, etc. My hair is very fine and delicate, and there's not enough of it to risk damaging it. Every so often I'll go through my hair and snip of individual split ends with a pair of sharp scissors especially reserved for my hair. I also love occasional oilings, honey rinses, and other pampering things to make it particularly soft and shiny. STYLES - More then anything, I love my hair long and down. I twist one or two damp buns the night before, and in the morning when I took them out I'd have very soft, shiny waves. I'm really looking forward to getting my hair long enough to do that again. When I want a stronger curly/wavy look, I'll twist several small buns all around my head, and then give the curls a good brushing in the morning to achieve a 40's look. I love vintage hair styles. I just love them! My favorite one right now is the one you see in my avatar: bun waves, pulled up to the top of the head and arranged just so. When my hair is longer again, I'll start doing french braids. Mine is wavy and about to the middle of my back right now. I'm trying to grow it out. My favorite style is the same as both of yours, it sounds like - pulling the top part back with a clip and letting the rest be down. Now that it's getting longer, I like to braid it, too. If I have to leave with it wet, I often put it up in one of those big clip things. I shampoo/condition every other day, and just condition on the othre days. I am thinking of looking into this "Curly Girl" thing, though. After I shower, I comb it out wet, and then usually brush it when it's dry (unless it's braided or up). Before bed, I brush it out and braid it so it doesn't get all tangled and uncomfortable at night. Scrolling over the "Got Curl" graphic at the top left brings up the menu of pages. I am also a Mildly Wavy girl (in my 50's, ha! ), so my usual routine is very similar to yours, mamselle duroc. My hair is very full-bodied and I absolutely cannot use a blow dryer unless I want to look like I've been electrocuted. Growing up I mostly kept my hair long with regular trims to deal with the split ends. After seven children and (many years! )my hair will not grow long like it used to. It gets to a certain length and starts splitting. So now I keep my hair around shoulder length. It's long enough to pull back in a ponytail, a bun, or with a jaw clip. If I feel really elegant I can even do french twist. I wash my hair every other day as well. I don't always feel like using a hair dryer. When it comes to doing my hair, I do have a style. Since I have done it for years, I have it down to a science....it gets done in about 5-7 minutes. It isn't anything glamorous or "over the top" I have layers and the top layer flips under and the bottom up. I love it! It is simple!! My hair is about 8 inches past my shoulders. I prefer it this length (or longer- but I've never had it longer, yet!) because I can do so much more with it! My favorite hairstyle is keeping it down, with perhaps a small clip on the side or sometimes a headband. I like to straighten or curl it, but keep it down. During the week though, I tend to throw it into a ponytail or braid it. I just stopped by to ask you two if you could *please* not write in pink? I read this site through Google Reader, and the article is impossible to read if they're in pink font in a white background! My hair is medium length and is mostly in a bun or a ponytail in the summer. I get more creative in the cooler temperatures! I like to curl it and pin it up for a dressy look. I have had the same style for years - long with no bangs (though I did cut bangs once while in college - never again!) I usually only wash my hair once or twice a week. I know that sounds gross but once your hair is used to it - it does not get oily between those long times. Also, I don't use shampoo and conditioner, in the normal sense. I most often use baking soda to wash my hair and will sometimes use the natural soap in the shower. It takes a while to get used to this system but I have found it is worth it. I am really trying to use all natural soaps and cosmetics lately. (As well as an all natual diet - which is much harder!) Honey can be used as a natural conditioner if needed. I am blessed to have hair that does not tangle easily and therefore I do not have to use it. It was then that I found out that I had kept the natural curl that I had at birth. My hair is really pretty curly. A few years ago, I had really long hair, for me. It was down to the middle of my back. I hated it, but I wish I hadn't cut it. I decided I'd grow my hair back out and now it's about a half-inch down my shoulders when it's curly. I have used ever so many shampoos and conditioners, but I now am using Herbal Essence. It seems to work really well. I use the curly girl methods, but I do not use the method of never washing your hair with shampoo. That's not for me! I always wear my hair in curls, mostly pulling it back a little with a few clips. I sometimes wear headbands. I defuse it every Sunday and I love that effect. I add mouse and hairspray sometimes. I want to grow my hair really long. When I have reached my previous length I can get bangs! (Mother's agreement) Thank you for your wise words of advise. Yay, a post on hair! I love the photos of your hair, I wish mine grew like that but unfortunately i've had a few periods in recent times where I couldn't look after it due to illness and had to get it cut shorter. The photo in my profile is from March sometime this year, and my hair is now about waist length. At one point I could sit on it and I am trying to grow it out that long again but it's taking its time to do so. I had my hair to my earlobes until I finally convinced my mother to let me grow it when I was 4 or so, and I've had it long-ish ever since. Until I was 12 (or maybe a little later?) it was basically to a set length, about to the bottom of my shoulderblades, because I had it trimmed so often - this was partly because I had very fast growing hair and bangs (which my mother loved and I despised and I finally managed to grow out the summer after I turned 10 years old) which needed trimming often in order for me to see. The most recent 'cut' was to my shoulders in April '07, before then I just had it blunt cut across the bottom. These days I want something that looks nice without much effort, so I've had it layered and feathered a little, which makes it wavy rather than just long and dead straight. When I have the energy (which is not often) or I can borrow my Mum to help me I love the old fashioned styles, especially Edwardian ones, and I often wear my hair in braids during summer to keep it neat and off my neck and back. Most days I just wear it in a ponytail though, sometimes with a ribbon, or use a pretty claw clip to twist it up into a high ponytail. As for shampoo - I like Garnier, which I converted my family to a few years ago. It's not very good for my skin but it makes my hair look better than any other shampoo, and it also needs washing properly less often, I've found. The most complex styles I've ever had were for the very formal dances we have in our senior year of high school - my school was small so the juniors were invited too! One year I had my hair like Audrey Hepburn in Breakfast at Tiffany's (which was fun) and the next I had it woven slightly then most of it was pinned into a bun made of tight rings, almost like a flower, high on the back of my head, and the last bits were curled into loose ringlets and left to hang over one shoulder. It looked beautiful, but my date's mother helped me take all the pins out at 3am - we filled a jam jar with them, and then I tipped a bucket of water over it, leaning over the bath, in order to make it soft enough to sleep comfortably. It was worth it, I wish I could recreate it some day. My hair is at my waist, and I love it long! Normally I leave it down, part it on the left side, and use four bobby pins to pin it back (I love bobby pins)! When it gets too hot or when I work outside or in the kitchen, I loosely roll it in a bunn on the top-back of my head and clip it. I also love to use heat rollers for church or weddings. I wash my hair every day and blow-dry it until its just damp. My hair is more than half way down my back with layers. I only get my hair trimmed about once a year. I have had every hair style and color you can think of as i use to be a stylist in a salon. I think I look terrible with short hair. My husband loves it long. I have very thick wavy hair and I wash it every day. I shampoo and condition it and usually let it air dry. I can also dry it and straighten it or use gel to scrunch it up and wear it very curly. I lvoe my hair because I can do so many things with it. Both my daughters have the same color and texture as I do. I mostly like to wear it totally natural. This summer has been so hot though so I have been wearing it twisted up in a clip in back. When I was about 12-years-old, my straight hair started to get really frizzy and wavy, so I started straightening it with a flat iron. That took a lot of time, and after a couple of years, I was tired of it. I had no idea what to do. I didn't know that I was actually had curly hair - I thought it was stuck in between. But then I started using the Curly Girl method, like some of the girls in the previous comments mentioned. I love it! It was such a change because I had no idea my hair was curly. I've been curly for one year now. Though I sometimes miss my straight hair (mostly because I can't brush now), I love to style my curls. It's been fun! * How long is your hair and why? * What do you do to care for your hair? I don't use shampoo or conditioner, but I use baking soda and vinegar, and sometimes honey, lemon juice, or chamomile tea. :) Feel free to ask. * What is your favorite hair style? My hair is layered, the short layer is just above my shoulders and the other layers go down till about my mid-back. I let my hair air dry most of the time. My hair kind of naturally fluffs, and the shortest layer tends to curl under just perfectly. However, sometimes I do dry my hair to make it 'perfect' or if my side bangs need an extra minute of work to keep them from falling flat on my face. But, if I can go without the hair-dryer...I will. I used to have long hair that was just past my rear end (3 1/2 feet long), but since I hadn't trimmed it in a while and I was feeling adventurous and wanted layers, I had it cut off. I think really long hair makes you look ultra feminine...IMHO. BTW, I just love how fluffy/curly your REALLY long hair is, Miriam! Seeing your's and Anna's long hair almost makes me long for my long hair again. :-) I would like to grow it out again to be as long as I can get it to be, I think. I don't like spending too much time on my hair. I'm kind of lazy about that...less is more. I part my hair to the side. I try to wear my hair down as much as possible so I don't get a lot of breaks, but otherwise, it's usually in a pony-tail or part of it is pulled back with a headband or a clip. I brush my hair every morning and night and usually at least once during the day, if not more...just to keep it nice looking and not like a ragamuffin-do. I shampoo and conditioner my hair. I focus the shampoo more on the crown of my head and the conditioner more so on the length...especially the ends. I wash my hair every other day, usually. For the same reasons that you both mentioned. As for extra thoughts...I don't think any length of hair on girls is bad or anything. But, girls look prettier with longer hair (below the ears or longer)...IMHO. ;-) I like to keep mine just long enough so I can still put it up if need be. I love this series you are doing! I wash my hair every-other-day ... I use a little bit of "natural" shampoo, followed by a LOT of "natural" conditioner. I don't brush my hair when it's wet, but let it air-dry and then brush it until it's shiny and bouncy. I think my favourite hairstyle is a simple one I learned from my grandmother, who also has long hair - at ages 72! I take a little bit of front hair and slip it into a slide at the back of my head, but leave the rest long and loose. I also like regular braids (usually one, because two make me look VERY young!) and French braids. Sometimes I start two French braids on my head, which I combine into one and twist into a bun at the bape of my neck. And I love to use hair sticks to keep a braided bun in place - hair sticks are fun and pretty and MUCH less hassle than hair pins! Thanks for all your comments, girls! They are fun to read! As some have mentioned, my hair too gets thin in the ends, which I have to trim every-so-often so it doesn't look stringy. My hair is a lot more fine then Miriam's! I've heard a lot about the curly girl method, and I've always wanted curly hair! However, I don't really think it would work for me, especially with all the times I have to brush my hair to get it in a smooth bun. I do try to focus shampoo on the scalp and conditioner on the ends, however. I use the basic suave shampoo for oily hair. Just about the only one out there for hair like mine. I never brush my hair wet. It tears if I do, and always brushes better dry. I have a big problem with split ends, so I think I'll end up having to cut a large part of it off. I cut about five inches of every year or so to keep it the same length and try to get rid of some of the bad ends. is one I like for special occasions. I like to "bob" my hair every once in a while. I roll it all up with a wand I made akin to a Hairdini. My hair has never been very short, so that's always fun. I think the best thing is just to do what works for you. Petite people with fine hair shouldn't put it up under big hats. I learned that the hard way, you look bald. :) If you have hair that tends to be poofy, use styles that pull it away from your face, and small simple barrets. Experiment, and get a second or third opinion. Generally speaking, what you like is what will look best on you, (an amazing phenomenon) but there are exceptions. I try to remember, first and foremost, that what you do with your body and hair is not about making you look good, it's about giving glory to God. (1 Peter 3:3-4) Best wishes to all of you in your efforts! I always had my hair longer than my waist when I was younger but about 3 years ago, I started donating it to Locks of Love. Lord willing, this next month I'll do so again. :) It's about at my waist right now. - How long is your hair and why? At the moment shoulder length hair. I used to have as long hair as Miriam has now but when I was 19 I wanted a new look and cut it to chin length. And then it was actually my very first hairdresser experience :) Up to that age my aunt cut my hair. I am letting my hair grow for now. I'd like to have waist length hair but I think it looks better shorter because of its flairness. I have had various styles and colours in my hair but for now I want to keep it natural and easy to care of. - What do you do to care for your hair? I'm a natural blonde and I have very typical Finnish hair type: lots and lots of hair but very thin and silky. For brighten up the colour I use silver shampoos and conditioners for dry ends. I wet my hair daily, sometimes 2-3 times a day depending on my swimming rehearsals and I wash it every other day with shampoo. I have to use high quality products because of my swimming hobby and having a sauna several times a week. Our climate is also quite rough to hair (and skin) so extra care is needed. I go to hairdresser 3-4 times a year. - What is your favorite hair style? I have shoulder length hair which is very curly. I wish I that I had hair as long as yours! I also try and wash it every other day. It is so nice after I wash it (it is very soft), but like both of you, I don't like having to wait for it to dry every day. I also let my hair air dry. If I use a hair dryer it gets extremly poofy. My hair is about chin length, it's in a modern/retro style bob, with graduation towards the back. My hair was originally about 3-4 inches above my waist, but 2.5 hours of blow-drying and straightening was unbearable. So i decided to just get it really short, and i LOVE it. It only takes 5-10 minutes to get it completely dry and styled. I have very thick hair so this is GREAT. I usually use sunsilk shampoo every other day because i dont want to damage my hair. And deep conditioning is really great for hair! It helps to eliminate split ends and prevent them. I love a long straight chic hairstyle, as well as big curls that make your hair seem really full and feminine. I used to wear my hair like that as often as manageable. Hi! I am a new reader and I am really enjoying your blog. I wanted to comment on this even though it is really old. My hair is a little longer then Miriam hair. I have never cut my hair short and have been growning it for as long as I can remeber. I wear my hair down in a braid or pony tail around the house, but I never leave the house with my hair down. I decided to live by the idea of the only people to see my hair down, until I get married, is my family. So I always have it up around boy. I know it is a little old fashion, but a lot I do is old fashion. One more thing, an idea on a Girly thing discuccion: Are empire-waist dresses modest or not. Let's see . . . I have my hair two-or-three inches (I didn't measure exactly) below my shoulders, mainly because I don't like it short and can't seem to grow it any longer. (Whenever I try, I only get split-ends which have to be removed. Does anyone have any solutions to that? Please, that would be extremely helpful.) It's a good length and easy to take care of -- I wash it and brush it, mainly! It's straight, but it has a slight wave which I like. My favorite hairstyle, besides just down, is either two braids or two ponytails on each side of my neck. I actually like the braids better, but the ponytails are easier to fix. I like to use clip-on bows in them too! My opinion on hair is basically summed up in 1 Corinthians 11:14-15. P.S. Miriam -- your hair is beautiful! My hair is just below my ears and really, really curly! I like it straight better then curly. When its curly, I have to wet it every day and that always frustrates me because I'm not a fan of sticking my head in the bath tub all the time!!! And its soooo thick!!! I can never seem to get it the way I want to go unless its straight.